Sorry, it seems that the page you were being directed to does not exist or has moved! Please use the menu above or the product search icon on this page to help you find what you’re looking for. 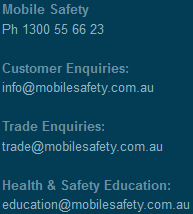 If we can be of any assistance please contact us on 1300 55 66 26 or email@mobilesafety.com.au.